I have yet to read this book, but it sounds great! My favorite family dish is a hard question to answer. My mom is a wonderful cook and I like to that some of the rubbed off on me! But if I would have to pic one....it would have to be her vegetable soup. I swear no matter how many times I watch her make it and get the recipe, it never tastes the same as when she makes it. Now I'm hungry! 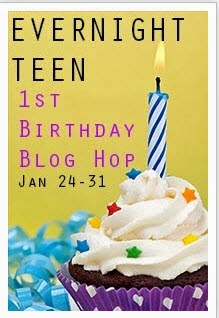 Thanks for the giveaway and Happy Birthday to Evernight Teen. My favorite family dish is potato pancakes , sausages and cream corn. Pizza is our fave family dish. I follow by email (lorih824 at yahoo dot com). My favorite family dish is rice and beans. I'm of French/Italian descent. I love my pasta and desserts. My memere's crepes were always a favorite, and my grammy's spaghetti sauce. They've both passed on, but I make both recipes for my kids now. My favourite family dish is a dessert Pavlova. My granny used to make it now my dad does delicious. I tried yo leave a comment on Stephanie, Christine and Bridie but WP would not accept my account and password. My family's favorites are too diverse. A key one though is Tuna Macaroni Salad. It is made with macaroni, tuna, apples, cucumbers, celery, mayo with seasonings. Lasagna is our favorite family dish. My favorite family dish is homemade pizza. My favorite family dish is lasagna. How can you go wrong if it has lots of cheese?! I'd love to try flautas, they sound really yummy!